Know what it looks like before you buy it. We do everything here, in-house. huge group emails, finger pointing, or excuses. Hello! TVSETDESIGNS.COM is your broadcast set design solution. Thank you for visiting our site. 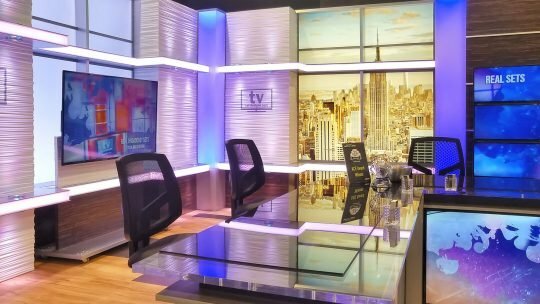 TV set designs has been created in order to help broadcast professionals get up-front pricing, sizes, and possibilities for stock and custom furniture and backdrops for broadcast studio set design. From simple start up webcasts and podcasts to advanced network television news sets and talk shows, we have what your company or client needs. Please browse our catalog of products to find what you need. Should you not find the solution that works for you on our site, please feel free to contact us for pricing, as we can make any design vision a reality. Broadcast set design, fabrication, and installation. Stock and custom broadcast set furniture, architectural, features, backdrops, and lighting. Talk shows, news, sports, instructional, sales, webcast, and any other style of broadcast. We took home Best of Show: Small Islands from the National Association of Broadcasters Show this year! Thank you to everyone involved. Do you have any questions or orders to place? Just talk to us. We don’t have a sales staff. You’ll be immediately answered by one of our project managers, designers, or engineers. We’re fully knowledgeable, and ready to help your broadcast work for you. Our company has been designing and building walls, backdrops, and scenery for broadcast and tv set design for 30 years. Our design and fabrication staff focus on the important things. The details. We’re accustomed to broadcast production schedules, and how fast they move. We have been refining this process for 20 years now, and have grown quite fond of it. Essentially, we design and build a set of tools for accomplishing a visual goal. The end result is a broadcast set solution that is versatile, reconfigurable, reusable, and professional. These components last, and can be put to many uses. Just wanted to thank you all for doing such a stellar job on our project from start to finish! Everyone here is thrilled with the look and quality of the desk and the logo. I’m so impressed with all the thoughtful touches like including visual instructions, and even all the necessary tools! You guys are the best! Thank you so much for your patience, efficiency, attention and most of all just a darn good product. You and your team have a lot to be proud of. I will certainly be in touch again as future needs dictate! Just wanted to let you know, the desk arrived and it looks great! Thanks to all of you for a job well done! Tony CipollaSan Luis Sheriff's Dept. We received our replacement panels today — thank you. I work with many vendors year-round to a wide range of customer service experiences; working with your company was nothing short of extraordinary and I am appreciative for all of your efforts to help us realize our set. Hopefully we can find a good excuse to work together again in the future. Thanks so much! Everyone there has been an absolute pleasure to work with. I really appreciate all the attention you’ve given this project. I can honestly say that this is—without a doubt—the most pleasant purchasing experience I’ve ever been involved in. I can’t wait to set it up! We could tell you about our products all day long, but the thing you really want to see is images. If you find something you like, click on it to see more info and other models like it. Keep in mind that every component of our broadcast studio set designs is made custom, so you can change any paints, powder coating, colors, laminates, or opacity. Look at it, get excited, and contact us. You’ll be able to find these in the Products section of our menu, with sizes and pricing.